Are you receiving more feedback than you could ever read, let alone summarize? Maybe you’ve used text analytics methods to analyze free-form textual feedback? These methods range from simple techniques like word matching in Excel to neural networks trained on millions of data points. Here is my summary to break down these methods into 5 key approaches that are commonly used today. Text analytics is the process of extracting meaning out of text. For example, this can be analyzing text written by customers in a customer survey, with a focus on finding common themes and trends. The idea is to be able to examine the customer feedback to inform the business on taking strategic action, in order to improve customer experience. To make text analytics the most efficient, organisations can use text analytics software, leveraging machine learning and natural language processing algorithms to find meaning in enormous amounts of text. How is text analytics used by companies? To take Thematic as an example, we analyze the free-text feedback submitted in customer feedback forms, which was previously difficult to analyze, as companies spend time and resource struggling to do this manually. Subsequently, we use text analytics to help companies find hidden customer insights and be able to easily answer questions about their existing customer data. In addition, with the help of text analytics software such as Thematic, companies can find recurrent and emerging themes, tracking trends and issues, and create visual reports for managers to track whether they are closing the loop with the end customer. For a long time, I’ve been planning to write a post to clarify what’s possible in text analytics today, in 2018. Throughout my career, I’ve spoken with many who are living through the pain of analyzing text and trying to find a solution. Some try to reinvent the wheel by writing their own algorithms from scratch, others believe that Google and IBM APIs are the saviours, others again are stuck with technologies from the late 90’s that vendors pitch as “advanced Text Analytics”. I’ve spent the last 15 years in Natural Language Processing, specifically in the area of making sense of text using algorithms: researching, creating, applying and selling the technology behind it. My academic research resulted in algorithms used by hundreds of organizations (I’m the author of KEA and Maui). The highlight of my text analytics career was at Google, where I wrote an algorithm that can analyse text in languages I don’t speak. And for the past 3 years, in my role as the CEO of Thematic I‘ve learned a lot about what’s available in the market. So, it’s fair to say, I’m qualified to speak on this topic. I’ll try to be objective in my review, but of course, I’m biased because of my position. Happy to discuss this with anyone who is interested in providing feedback. Here is my summary to break down these methods into 5 key approaches that are commonly used today. Let’s start with word spotting. First off, it’s not a thing! The academic Natural Language Processing community does not register such an approach, and rightly so. In fact, in the academic world, word spotting refers to handwriting recognition (spotting which word a person, a doctor perhaps, has written). There is also keyword spotting, which focuses on speech processing. But to my knowledge, word spotting is not used for any type of text analysis. But I’ve heard frequently enough about it in meetings to include in this review. It’s loved by DIY analysts and Excel wizards and is a popular approach among many customer insights professionals. The main idea behind text word spotting is this: If a word appears in text, we can assume that this piece of text is “about” that particular word. For example, if words like “price” or “cost” are mentioned in a review, this means that this review is about “Price”. The beauty of the word spotting approach is its simplicity. You can implement word spotting in an Excel spreadsheet in less than 10 minutes. Or, you could write a script in Python or R. Here ’s how. Various issues can easily crop up with this approach. Here, I’ve annotated them for you. Out of 7 comments, here only 3 were categorized correctly. “Billing” is actually about “Price”, and three other comments missed additional themes. Would you bet your customer insights on something that’s at best 50 accurate? You can imagine that the formula above can be tweaked further. And indeed, I’ve talked to companies who hand-crafted massive custom spreadsheets and are very happy with the results. If you have a dataset with a couple of hundred responses that you only need to analyze once or twice, you can use this approach. If the dataset is small, you can review the results and ensure high accuracy very quickly. There are also many other disadvantages to DIY word spotting, that we’ll discuss in the next post. I’ll also talk about what actually does work and is a good approach. The Manual Rules approach is closely related to word spotting. Both approaches operate on the same principle of creating a match pattern, but these patterns can also get quite complex. Majority of Text Analytics providers as well as many other smaller players, who sell Text Analytics as an add-on to their main offering, provide an interface that makes it easy to create and manage such rules. They also sometimes offer professional services to help with the creation of these rules. The best thing about Manual Rules is that they can be understood by a person. They are explainable, and therefore can be tweaked and adjusted when needed. But the bottom line is that creating these rules takes a lot of effort. You also need to ensure that they are accurate and maintain them over time. To get you started, some companies come with pre-packaged rules, already organized into a taxonomy. For example, they would have a category “Price”, with hundreds of words and phrases already pre-set, and underneath they might have sub-categories such as “Cheap” and “Expensive”. They may also have specific categories setup for certain industries, e.g. banks. And if you are a bank, you just need to add your product names into this taxonomy, and you’re good to go. The benefit of this approach is that once set up, you can run millions of feedback pieces and get a good overview of the core categories mentioned in the text. Just because a word or a phrase is mentioned in text, it doesn’t always mean that the text is about that topic. For example, when a customer is explaining the situation that leads to an issue: “My credit card got declined and the cashier was super helpful, waiting patiently while I searched for cash in my bag.” This comment is not about credit cards or cash, it’s about the behavior of the staff. Knowing the general category alone isn’t enough. How do people think about “Price”, are they happy or not? Capturing sentiment with manually pre-set rules is impossible. People often do not realize how diverse and varied our language is. So, a sub-category like “expensive” is actually extremely difficult to model. A person could say something like “I did not think this product was expensive”. To categorize this comment into a category like “good price”, you would need a complex algorithm to detect negation and its scope. A simple regular expression won’t cut it. 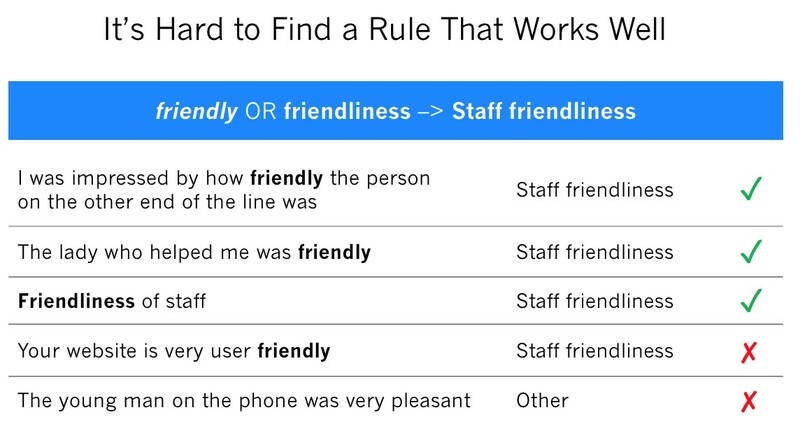 In any industry, even if you have a working rule-based taxonomy, someone with good linguistic knowledge would need to constantly maintain the rules to make sure all of the feedback is categorized accurately. This person would need to constantly scan for new expressions that people create so easily on the fly, and for any emerging themes that weren’t considered previously. It’s a never-ending process which is highly expensive. And yet, despite these disadvantages, this approach is the most widely used commercial application of Text Analytics, with its roots in the 90s, and no clear path for fixing these issues. So, are Manual Rules good enough? My answer to this is No. Most people who use Manual Rules are dissatisfied with the time required to set up a solution, with the costs to maintain it, and how actionable are the insights. Let’s bring some clarity to the messy subject of Advanced Text Analytics, the way it’s pitched by various vendors and data scientists. Here, we’ll be looking at Text Categorization, the first of the three approaches that are actually automated and use algorithms. This approach is powered by machine learning. 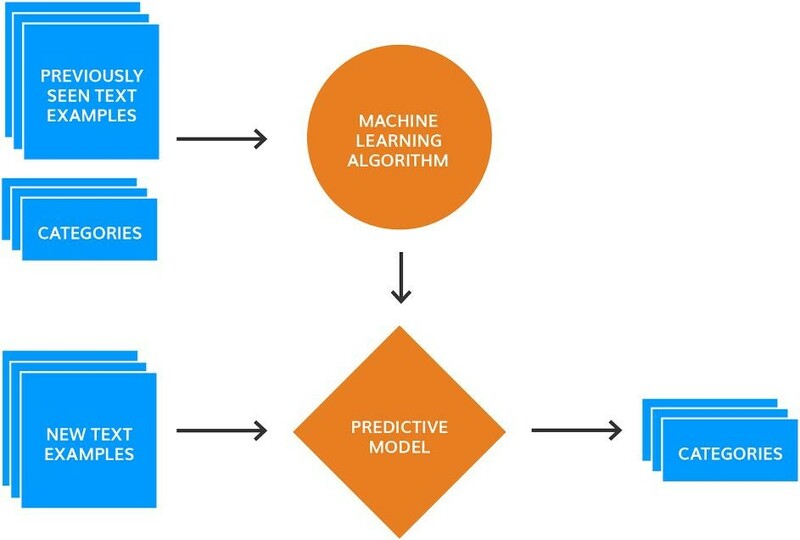 The basic idea is that a machine learning algorithm (there are many) analyzes previously manually categorized examples (the training data) and figures out the rules for categorizing new examples. It’s a supervised approach. The beauty of text categorization is that you simply need to provide examples, no manual creation of patterns or rules needed, unlike in the two previous approaches. Another advantage of text categorization is that, theoretically, it should be able to capture the relative importance of a word occurrence in text. Let’s revisit the example from earlier posts. A customer may be explaining the situation that leads to an issue: “My credit card got declined and the cashier was super helpful, waiting patiently while I searched for cash in my bag.” This comment is not about credit cards or cash, it’s about the behaviour of the staff. The theme “credit card” mentioned in the comment isn’t important, but “helpfulness” and “patience” is. A text categorization approach can capture it with the right training. It all comes down seeing similar examples in the training data. There are academic research papers that show that text categorization can achieve near-perfect accuracy. Deep Learning algorithms are even more powerful than the old naïve ones (one older algorithm is actually called Naïve Bayes). And yet, all researchers agree that the algorithm isn’t as important as the training data. The quality and the amount of training data is the deciding factor in how successful this approach is for dealing with feedback. So, how much is enough? Well, it depends on the number of categories and the algorithm used to create a categorization model. The more categories you have and the more closely related they are, the more training data is needed to help the algorithm to differentiate between them. Some of the newer Text Analytics startups that rely on text categorization provide tools that make it easy for people to train the algorithms, so that they get better over time. But do you have time to wait for the algorithm to get better, or do you need to act on customer feedback today? You will only learn insights about categories that you trained for and will miss the unknown unknowns. This is the same disadvantage as manual rules and word spotting has: The need to continuously monitor the incoming feedback for emerging themes, and miscategorized items. While the algorithm gets better over time, it is impossible to understand why it works the way it works and therefore easily tweak the results. Qualitative researchers have told me that the lack of transparency is the main reason why text categorization did not take off in their world. For example, if there is suddenly poor accuracy on differentiating between two themes “wait time to install fibre” and “wait time on the phone to set up fibre”, how much training data does one need to add, until the algorithm stops making these mistakes? The lack of training data is a real issue. It’s hard to start from scratch and most companies don’t have enough or accurate enough data to train the algorithms. In fact, companies always overestimate how much training data they have, which makes implementation fall below expectations. And finally, if you need to refine one specific category, you will need to re-label all of the data from scratch. Transferability can be really problematic! Imagine you have a working text categorization solution for one of your departments, e.g. support, and now want to analyse feedback that comes through customer surveys, like NPS or CSAT. Again, you would need to re-train the algorithm. I just got off the phone with a subject matter expert on survey analysis, who told me this story: A team of data scientists spent many months and created a solution that she ultimately had to dismiss due to lack of accuracy. The company did not have time to wait for the algorithm to get better over time. Topic modelling is also a Machine Learning approach, but an unsupervised one, which means that this approach learns from raw text. Sounds exciting, right? Occasionally, I hear insights professionals refer to any Machine Learning approach as “topic modelling”, but data scientists usually mean a specific algorithm when they say topic modelling. It’s called LDA, an acronym for the tongue-twisting Latent Dirichlet Allocation. It’s an elegant mathematical model of language that captures topics (lists of similar words) and how they span across various texts. Each review is assigned a list of topics. 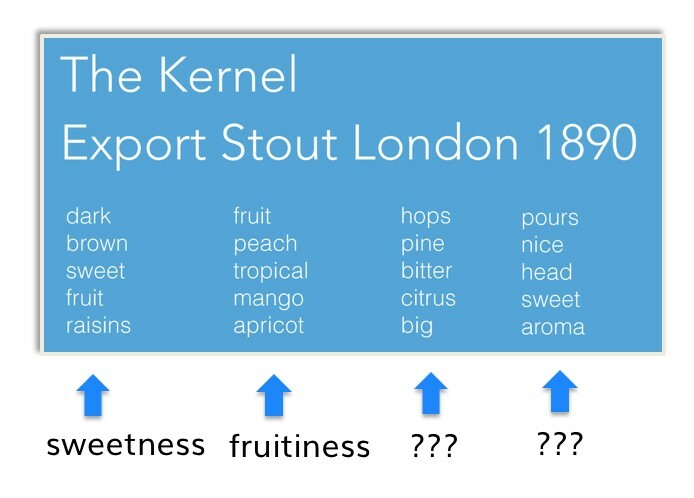 In this example, The Kernel Export Stout London has 4 topics assigned to it. The best thing about topic modelling is that it needs no input other than the raw customer feedback. As mentioned, unlike text categorization, it’s unsupervised. In simple words, the learning happens by observing which words appear alongside other words in which reviews, and capturing this information using probability statistics. If you are into maths, you will love the concept, explained thoroughly in the corresponding Wikipedia article, and if those formulas are a bit too much, I recommend Joyce Xu’s explanation. 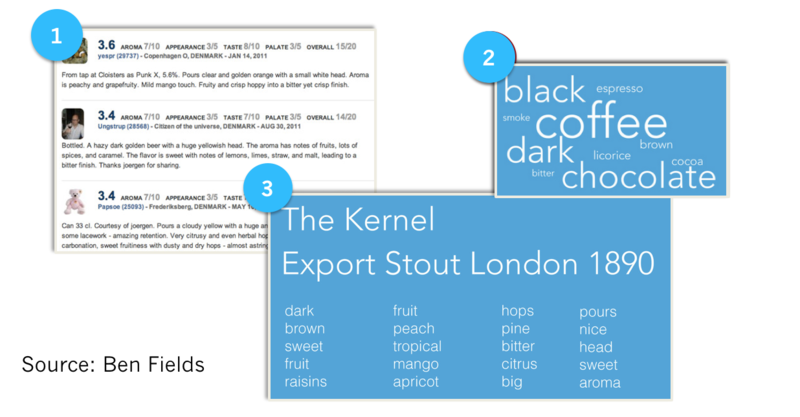 There are Text Analytics startups that use topic modelling to provide analysis of feedback and other text datasets. Other companies, like StitchFix for example, use topic modelling to drive product recommendations. They extended traditional topic modelling with a Deep Learning technique called word embeddings. It allows capturing semantics in a more accurate way (more on this in our Part 5). Whereas the first and the second topic can be somehow “named” as sweetness and fruitiness, the other two topics are just a collection of words. Any data scientist can put together a solution using public libraries that can quickly spit out a somewhat meaningful output. However, turning this output into charts and graphs that can underpin business decisions is hard. Monitoring how a particular topic changes over time to establish whether the actions taken are working is even harder. 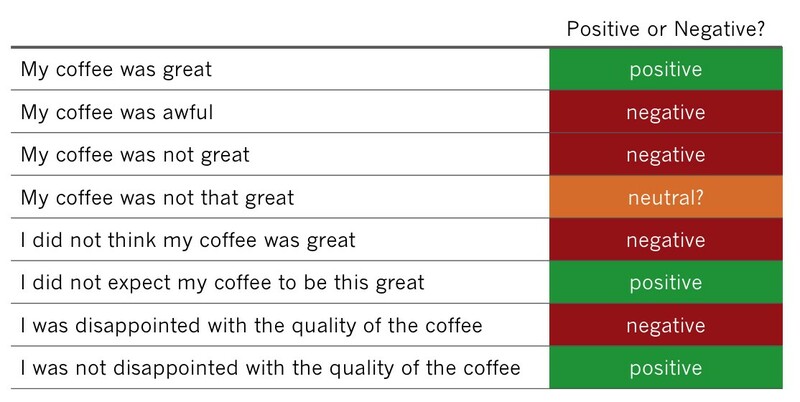 To sum up, because topic modelling produces results that are hard to interpret, because it lacks transparency just like text categorization algorithms do, I don’t recommend this approach for analysing feedback. However, I stand by the algorithm as one that can capture language properties fairly well, and one that works really well in other tasks that require Natural Language Understanding. All of the former approaches mentioned have disadvantages. In the best case, you’ll get OK results only after spending many months setting things up. And you may miss out on the unknown unknowns. The cost of acting late or missing out on crucial insights is huge! It can lead to losing customers and stagnant growth. This is why, according to YCombinator (the startup accelerator that produced more billion dollar companies than any other), “whenever you aren’t working on your product you should be speaking to your users”. After Thematic participated in their programme, we’ve been asked for advice three times via a survey, once via a personal email, and also in person. YCombinator also uses Thematic to make sense of all the feedback they collect. In my research, I’ve learned that the only approach that can achieve all three requirements is Thematic Analysis, combined with an interface for easily editing the results. Thematic Analysis approaches extract themes from text, rather than categorize text. In other words, it’s a bottom-up analysis. Given a piece of feedback such as “The flight attendant was helpful when I asked to set up a baby cot”, they would extract themes such as “flight attendant”, “flight attendant was helpful”, “helpful”, “asked to set up a baby cot”, and “baby cot”. These are all meaningful phrases that can potentially be insightful when analyzing the entire dataset. However, the most crucial step in a Thematic Analysis approach is merging phrases that are similar into themes and organizing them in a way that’s easy for people to review and edit. We achieve this by using our custom word embeddings implementation, but there are different ways to achieve this. The advantage of Thematic Analysis is that this approach is unsupervised, meaning that you don’t need to set up these categories in advance, don’t need to train the algorithm, and therefore can easily capture the unknown unknowns. The disadvantages of this approach are that it’s difficult to implement correctly. A perfect approach must be able to merge and organize themes in a meaningful way, producing a set of themes that are not too generic and not too large. Ideally, the themes must capture at least 80% of verbatims (people’s comments). And the themes extraction must handle complex negation clauses, e.g. “I did not think this was a good coffee”. Some of the established bigger players have implemented Thematic Analysis to enhance their Manual Rules approaches but tend to produce a laundry list of terms that are hard to review. Traditional Text Analytics APIs designed by NLP experts also use this approach. However, they are rarely designed with customer feedback in mind and try to solve this problem in a generic way. For example, when we tested Google and Microsoft’s APIs we found that they aren’t grouping themes out of the box. As a result, only 20 to 40% of feedback is linked to top 10 themes: only when there are strong similarities in how people talk about specific things. The vast majority of feedback is uncategorized meaning that you can’t slice the data for deeper insights. At Thematic, we have developed a Thematic Analysis approach that can easily analyze feedback from customers of pizza delivery services, music app creators, real estate brokers and many more. We achieved this by focusing on a specific type of text: customer feedback, unlike NLP APIs that are designed to work on any type of text. We have implemented complex negation algorithms that separate positive from negative themes, to provide better insight. Each dataset, and sometimes even each survey question, gets its own set of themes, and by using our Themes Editor, insights professionals can refine the themes to suit their business. For example, Thematic might find themes such as “fast delivery”, “quick and easy”, “an hour wait”, “slow service”, “delays in delivery” and group them under “speed of service”. One insight professional might re-group these into “slow” and “fast” under “speed of service”, another into “fast service” > “quick and easy”, and “slow service” -> “an hour wait”, “delays in delivery”. It’s a subjective task. I believe more and more companies will discover Thematic Analysis, because unlike all other approaches, it’s a transparent and deep analysis that does not require training data or time for crafting manual rules. 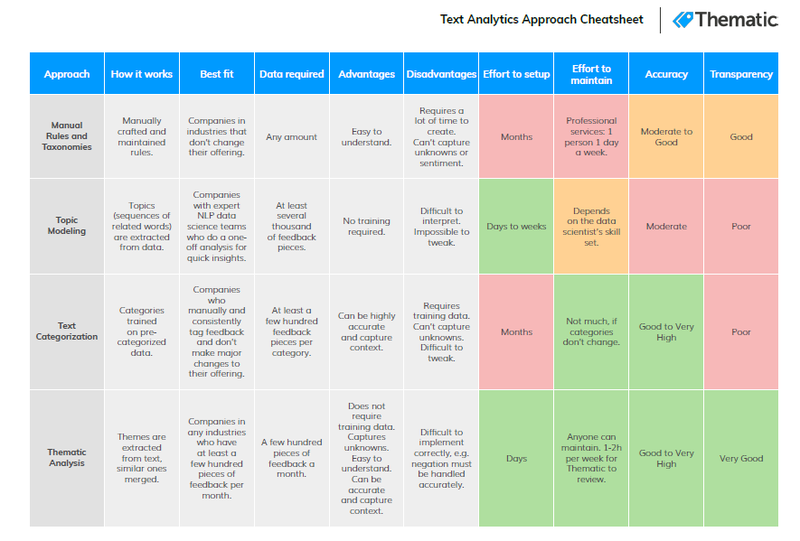 We’ve created a cheat sheet which lists the text analytics approaches, check it out here below or view the larger version here. Alyona Medelyan, PhD, is an expert in Natural Language Processing and Machine Learning. Alyona has extensive experience working with customer feedback data, such as surveys, social media data, call centre logs, and public forums. She is also CEO and co-founder of customer insight company Thematic.